Hunting / Re: Success in the turkey woods! Right on, Darren! Glad to see you didn't have another flash in the pan! Nice shot! Congrats and thanks for sharing your story Now after reading that im pumped for our Turkey opener this sat! Great story!! Turkey and mushrooms are hard to beat. Nicely done, Darren...turkey and mushroom..YUM! Hunting / Success in the turkey woods! 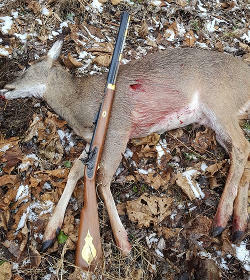 I had a little bit of luck this weekend at my family farm in Missouri after a sputtering start to my turkey season at a friend’s place the first part of the week. A good buddy of mine, who owns 160 acres adjoining us, called me Friday afternoon while I was driving to the Haverstick Home Place to tell me they were covered up in gobblers most of that morning. That was very good news considering the poor hatches we have had for the past three years. I arrived at Dad’s house with an extra spring in my step and optimism that the next day would be fruitful. About 5:15 Saturday morning, I drove over to the back side of our upper hay field to listen for birds. I have a lot of acreage to hunt so it is always a crap shoot on where to start out as one place is usually as good as another. The moon was still up bright and there was a pretty good frost on the grass as I stood there in the cold, still air waiting for that first gobble. It was a perfect morning and I suspected that the hollers would be ringing with the songs of lovesick toms. Well, that wasn’t the case. In fact, it was quiet as a tomb. I ascended the ridge to the east of me in hopes of hearing something from a loftier altitude. After about an hour of continued turkey silence, even to my championship worthy calling, I finally heard one ole bird sound off to the south in our neighbor’s upper hay field. That place is like a magnet for turkeys so I figured I would go over there and see if I couldn’t call him out of that field and onto our place. This field sits up on a plateau with a strip of timber between it and our middle hay field down below. There is an old road connecting the two fields and I walked on it as I tried to find a place to set up. The tom would gobble occasionally so I knew he was still around but he didn’t really have his heart in it. After finding a suitable spot, I broke out all my gear, settled in, and started calling. He responded immediately and I could soon hear him spitting and drumming. I cocked the hammer back on Sweet Rachael and waited for him to show himself. Instead of coming straight at me, the longbeard circled to my right and walked towards me strutting all the way. It looked like he was going to get right in my lap so I held off shooting until I was absolutely positive I had a shot clear of brush. At 25 yards, though, he stopped his advance and I knew immediately that the jig was up. He putted one time, did that Turkey Pirouette, and headed back the way he came. I probably could have killed him but I didn’t like any of the shots I had so I let him gobble another day. Which he did, repeatedly. I packed up my stuff and decided to go to our lower field to see if I could get something going down there. At the south end of our lower field there is a shady spot that is a mixture of walnut trees and grass. It butts up against a timbered ridge and deer and turkeys love to use that as a staging area. I walked into it and called a couple of times to see if anything was around. Of course, the bird I had spooked earlier answered but he was now across a creek in our neighbor’s lower field. I also got a hen to answer me about 100 yards up the timbered ridge so I set up quickly in hopes of getting her to bring me her boyfriend if she had one. The hen shut up but that gobbler across the creek was hammering it now. I thought I’d see how horny he was so I continued to call to him on the slim chance that he would fly across the creek. This went on for about 15 minutes before another gobbler fired off pretty close to where I had heard the hen. I called one more time and that bird answered, this time closer than before. I knew he was coming in so I quickly checked the powder in my pan and made sure my flint was set tight. When I heard him spitting and drumming, I cocked the hammer back and waited for him to make an appearance. I saw his blue head bobbing in the distance and I could tell by his trajectory that he was heading towards the field instead of coming to me. I putted to him once to change his course and he soon was headed my way. I had a jake and hen decoy out about 20 yards in front of me in hopes that he would come in close to whup up on that jake. I don’t know if the gobbler ever saw the decoys or what but when he was this side of 40 yards, he stopped, stretched his neck out, and got that “I’m getting the hell out of Dodge” look in his eye. When he turned to retreat, I decided that letting one bird walk away that morning was enough and I sighted in on his neck and pulled the trigger. He dropped like a stone and I immediately jumped up to go claim my prize. Here is a short video of the hunt. When I got to the bird, I wrung his neck for good measure and then gave thanks to his spirit for the food he would provide my family and the memories he gave me. I looked back to where I had been sitting and I couldn’t find my spot at first because I thought I was closer than I was. When I finally spotted my gear pile, the first thought that went through my head was, “Dang, that is a long ways!” I stepped it off and it was exactly 40 steps from my tree to the bird on the ground. I knew those Colerain turkey barrels were good but, man, I didn’t know they were that good! 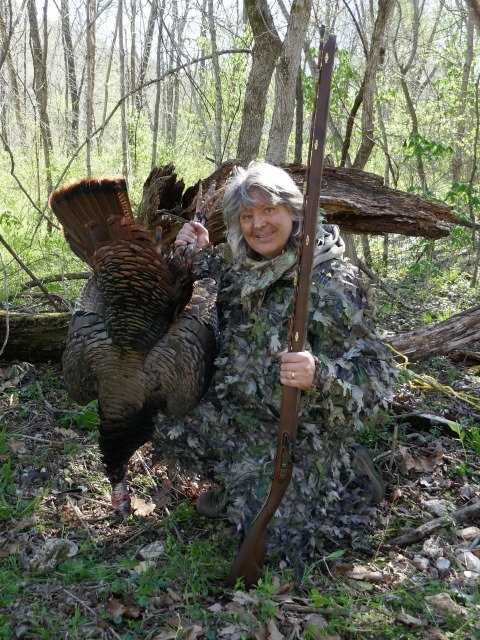 The tom weighed 18 pounds, 14 ounces, had a 9.5” beard and 1” spurs. My turkey load is 65 grains of 3F powder, 1 overpowder card, ¼” lubed wad, 1.5 ounces #6 shot, and 1 overshot card. 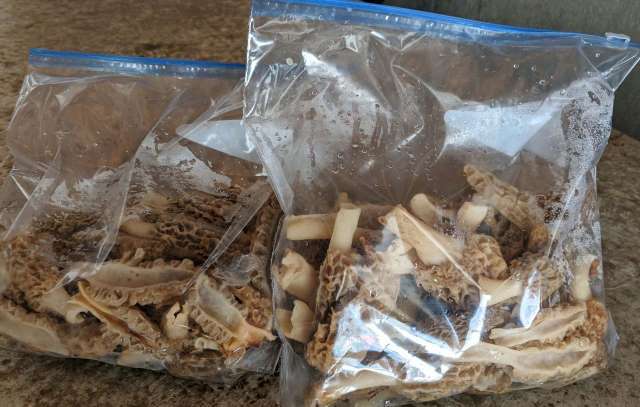 To make the day even better, I found a few mushrooms and then met up with my brother and friends to play some bluegrass at a fundraising event for Eminence High School. It was a great way to end an already great day. Life is good! long hunter it was in the Nebraska Sand Hills. Rick Hamiltons ranch. Rick sold his heard because of health issues. It was first class and I will miss that hunt. And my .36 is a tack driver! There's the answer...... at least for Yew!!!! Thanks for the input. It started out as my question that I emailed Doc about and he brought it to the forum to pick the brains of folks that have MUCH more experience than I. I just need to spend time with it and see for myself if there's a problem with excess patch over the front of the ball. That teeny ball can be pushed down and cut clean on the tag ends, it's just that the wider strips also used for 50/54's tend to overlap on the sides and I was most curious if it causes any accuracy issues with the extra material on the sides or should one cut the strips more narrow? David, I hope all’s well and good. I have a good supply of pillow ticking and not the precut strips. That way i can cut strips for less waste. I just happen to shoot a .36 cal flinter. I make my patches about 1 1/4 wide(7 stripe’s). If you want even less waste use a strip about 5 stripes. With the wider strip you don’t have to be as percise when centering the ball on the patch because of more material. I always cut at the muzzle which leaves me a lil patching in front but not covering the ball. And my .36 is a tack driver!